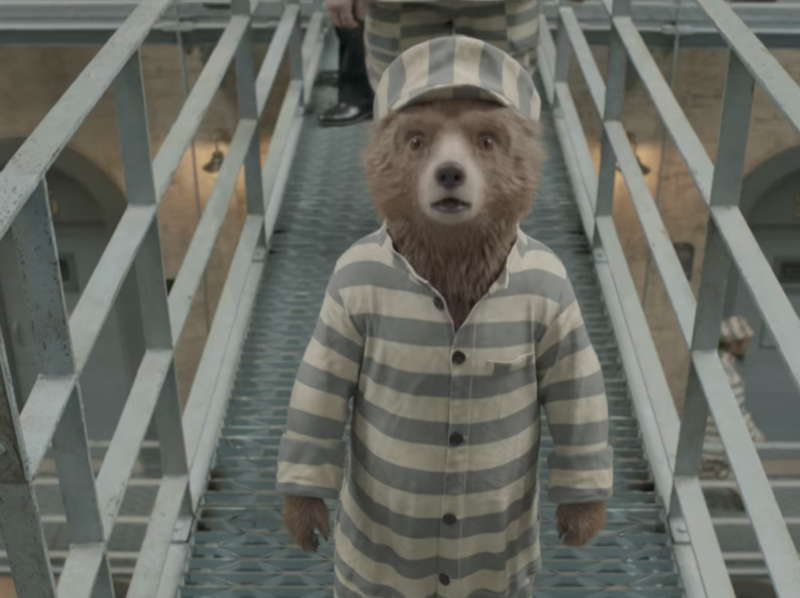 Listen to this: The new trailer for Paddington 2 has finally arrived…and our favorite marmalade-obsessed bear is in jail?! Just weeks after Warner Bros. won the U.S. distribution rights to the film, confirming that the highly anticipated sequel to the 2014 film would keep its January 12th release date, the studio released the trailer and it seems the beloved bear is in big trouble after being framed for theft by fading actor, Phoenix Buchanan (Hugh Grant). The sequel finds Paddington (Ben Whishaw) settling into life with the Browns in London nicely. And after stumbling across a rare pop-up book of London, Paddington decides to get a job in order to buy it for Aunt Lucy’s (Imelda Staunton) upcoming 100th birthday. After the book is stolen and Paddington is sent to jail for the crime, he must work to clear his name from inside the big house — while getting into the standard Paddington hijinks we’ve come to love, including turning all the prison uniforms pink — as Mary (Sally Hawkins) and Henry Brown (Hugh Bonneville) try and solve the case from the outside. Unfortunately, it seems Paddington and the Browns have met their match in Buchanan. He’s a master of disguise who dresses himself up as a knight, nun, beggar, and even a dog in this adorably outlandish trailer. It’s truly a masterful performance from Grant. And while the film won’t hit U.S. theaters until next year, it was released in the U.K. earlier this month and has been met with rave reviews, boasting a 100% score on Rotten Tomatoes. The film also stars Brendan Gleeson, Julie Walters, Jim Broadbent, Peter Capaldi, and Michael Gambon. With its release, it seems we’ll be seeing even more of the beloved bear and co. in coming years as Studio Canal has confirmed that a third film based on the popular Michael Bond children’s books is in the works, as well as an animated television series. Paddington 2 arrives in theaters on January 12th.